North American High Yield new issue average yields have been on the incline. Throughout 2018, a steady positive trend can be observed from January to November, when average yield peaked at 8.45%. Volatility in December effected virtually all markets, as depicted in the North American High Yield average yield chart below. A sharp decline represents a drop in new issues average yield by almost two percent. 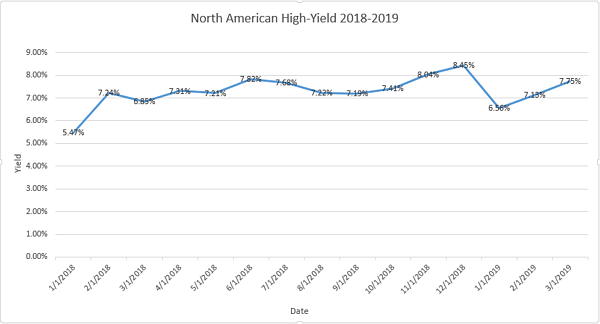 The new year has brought new growth to the High Yield space as average yield for North American High Yield new issues has steadily increased month over month. Overall, the average yield on North American High Yield new issues has increased 2.28% since the start of 2018. In 2019 alone, average yields on North American High Yield Bonds have increased 1.19%. Contact info@advantagedata.com to request a free trial and access data on thousands of high yield bonds.